I had a rough morning with my kids today. Neither of them brushed their teeth, although both of them said they had. My son’s drum book had gone missing, although he’s only had it for a week. All of his mitts were wet because no one reminded him to take them out of his backpack last night (he’s 10… I keep expecting that at some point he’ll remember to do it on his own). To top it off, it’s been 1000 degrees below zero for several weeks and we’re all tired of being perpetually frozen. I lost my temper and got to work feeling awful about myself. I’m sure they didn’t feel great either. I had expectations about how the morning would unfold. I expected they would brush their teeth (or at least not lie about NOT brushing their teeth). I expected that the drum book would be easy to find in preparation for the drum lesson tonight. I expected that after spending several hundred dollars on the best mitts money can buy, at least one pair of them would be dry. I’m sure my kids expected that their mother, an otherwise sane person, would not lose her mind about these mundane frustrations just before they left for school. My expectations for how my kids would behave this morning were, arguably, too high. They were also coloured by my own frustration with the weather and my own anxiety about the consequences of their actions. What will people think of me as a parent if their breath smells terrible? If he doesn’t have his drum book? If he goes to school in this temperature with wet mitts? What will that say about me? I’ve been wondering a lot about expectations this week as I’ve been visiting classes and observing students and teachers. It’s report card season in Ontario and teachers are furiously organizing documentation and writing comments. I remember it well. What I’ve observed in several classrooms has been a rush towards establishing students’ surface-level knowledge of concepts like shape names, numerals, letters, and colours in time for that noun recall to be formally reported on. Does the child know the name for a rectangle? Can she identify the colour blue? These assessments are happening outside of the play. Children are building and sculpting and imagining and conversing throughout the room while educators are pulling children out of the play to assess them on these noun recall tasks. There are two sets of expectations that concern me when I see this type of assessment occurring. The first aspect that worries me is that these assessments don’t get at what we’re expected to be teaching and assessing in Ontario. Looking just at the concept of shape, for instance, the curriculum tells us that as children progress through the Kindergarten program they “describe, sort, classify, build, and compare two-dimensional shapes and three dimensional figures, and describe the location and movement of objects, through investigation.” Nowhere in that expectation does it say “identify” or “name”. That’s very intentional on the part of the authors of the document. The document also provides examples of how me might support children’s questions and curiosities around the concept of shape by, for instance “identifying mathematical relationships with the children (e.g., two of their small blocks make one large one; different shapes can be combined to make a more complex pattern).” Later, the document asks us to remember that “children are highly capable of complex thinking. In order to avoid limiting the children’s thinking, and to help them extend their learning, educators [should] provide challenges that are at the “edge” of the children’s learning.” Simply naming shapes is not on the “edge” of most children’s learning in Kindergarten (what Vygotsky called the zone of proximal development). 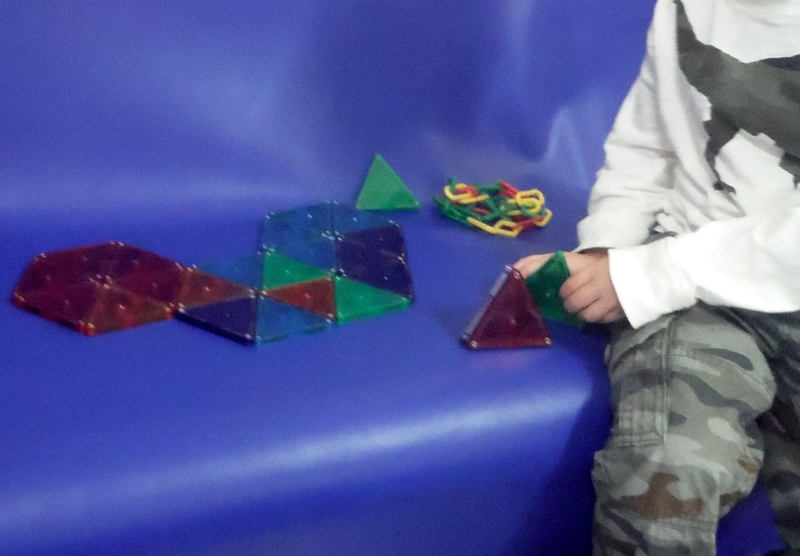 Children who cannot yet name the standard school shapes can nevertheless demonstrate complex thinking about symmetry, congruence, and the relationships between shapes in their building, drawing and sculpture. In an echo of Arthur Efland’s classic treatise on “The School Art Style,” I fear that these types of assessments slide us towards a “school math style” and a “school reading style” which, like “School Art” have little relationship to either the academic domains they’re allegedly preparing students for nor the spontaneous and sophisticated mathematical and linguistic play of children. A student’s representation of the CN Tower and his own imagining of a “downtown building.” What mathematical thinking can you observe? How could you create cognitive conflict in this centre to nudge this student’s learning forward? What questions could you ask? Treating math like it’s mostly about nomenclature reflects both a lack of understanding of the curriculum expectations but also an internalized expectation of the kind of thinking children are capable of between the ages of 3 and 6. The saddest part of this type of withdrawal assessment, for me, is how much is missed when educators are focusing on checklists. All around me, I see children interacting with materials and each other in sophisticated ways. 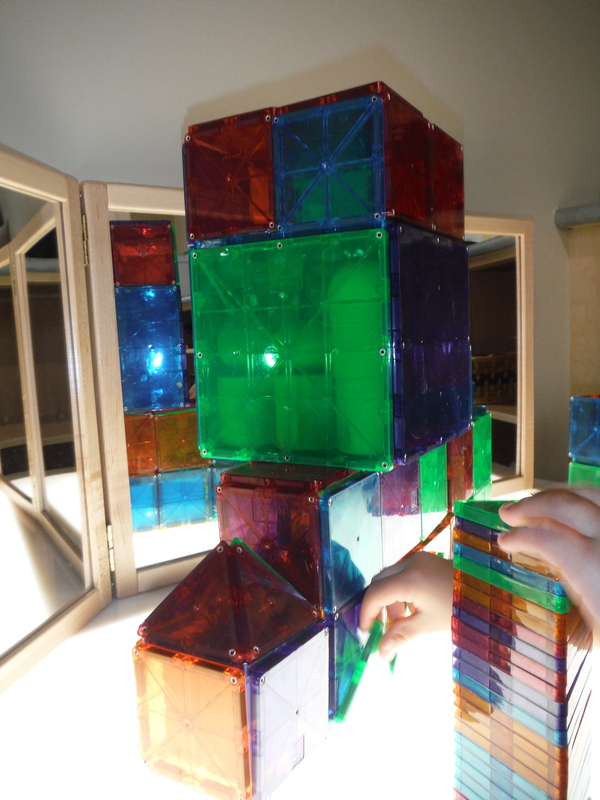 I see children exploring shape concepts in the building centre, I see children exploring colour mixing at the easel and I see children exploring quantity in their dramatic play. I had a great conversation with a child this week about the relationship between a sphere and and a circle as we played with clay together. You miss all that when you’re focused on getting every kid to make the same penguin or making sure every kid can identify a triangle. Teaching kindergarten is hard work, on a lot of different levels. It’s emotional work, it’s physical work, and yes, it’s intellectual work. Is it easier to assess students on surface-level nomenclature than to engage them in conversation during play or small-group instruction in order to assess their progress? It sure is! Does it get you the kind of data you need to move students forward? Does it inform the process of helping them to extend their learning, by providing them with challenges that are at the “edge” of their learning? I don’t think it does. Your expectations shape what you believe is possible for the children in your class. Expectations that focus on recall, memorization and nomenclature create a false ceiling for children’s learning and teach them that school is not about their creativity, their critical thought or their curiosity. Every time we prioritize recall-type individual assessment over being present in play, we teach children about what we value and what we expect. We can’t be surprised when we later have adolescents and adults who don’t think critically or creatively about problems and issues. We’ve taught them over and over again that those abilities don’t matter. When I get home tonight, I’m going to apologize to my kids for loosing my temper this morning and I’ll probably buy them a treat on the way to drum lessons as penance. My skewed expectation are relatively easy to repair, mercifully. Our lowered expectations in the classroom, however, are often very hard to identify, let alone change. We are very comfortable doing things how they have always been done and changing those practices puts us in that same, sometimes scary, zone of proximal development that we’re uncomfortable putting students in. In his book, Mathematizing, Allen C. Rosales describes the importance of creating “cognitive conflict” for students. He describes it as “the process of encountering new situations or facts that “conflict” with what we already deam to be true.” Other authors have used the terms “problematizing” or “de-facilitating” to describe this process of nudging student learning forward purposefully. Every time I’m in a Kindergarten classroom, I find my assumptions and expectations being challenged. I learn anew what marvels young children are capable of when our expectations allow them to demonstrate their incredible capacities. The supplies have started to arrive; it’s like a big birthday party. We don’t often have new supplies arriving en masse in public education so when it happens we (and I’m referring to the adults here) get a little silly. I performed a memorable happy dance in the hallway; I may never live it down. I’m always amazed by novelty and the impact it has on children (adults too) – you would think it would get old, but it really doesn’t. When our carpet first arrived, all the children, as a collective, lay down on the floor and rubbed their cheeks against the nubby surface. They just soaked it in, loving the feeling and enjoying the warmth after 2 weeks of sitting on cold tiles. Simple thing, big impact on our lives. Another piece of equipment that arrived at the same time was an instant favourite, as it has been every year. 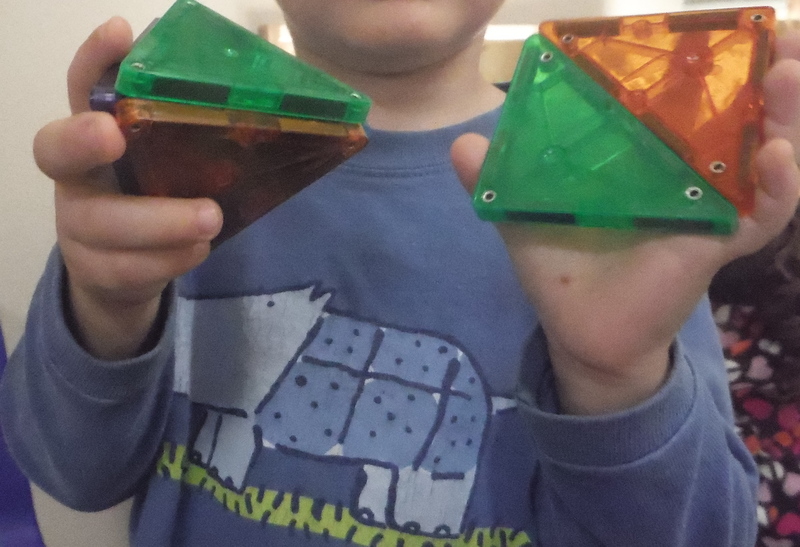 This toy seems to lend itself to sophisticated mathematical thinking; the relationships between 2-D and 3-D shapes, which shapes tessellate well and which do not, how to use one shape to build another. All of these things I had anticipated because I’ve seen them before. What I’ve never seen is the impact of having so many of a material on the quality of children’s play. This year we ordered double the number of tiles. Just look at what they’ve been able to accomplish! 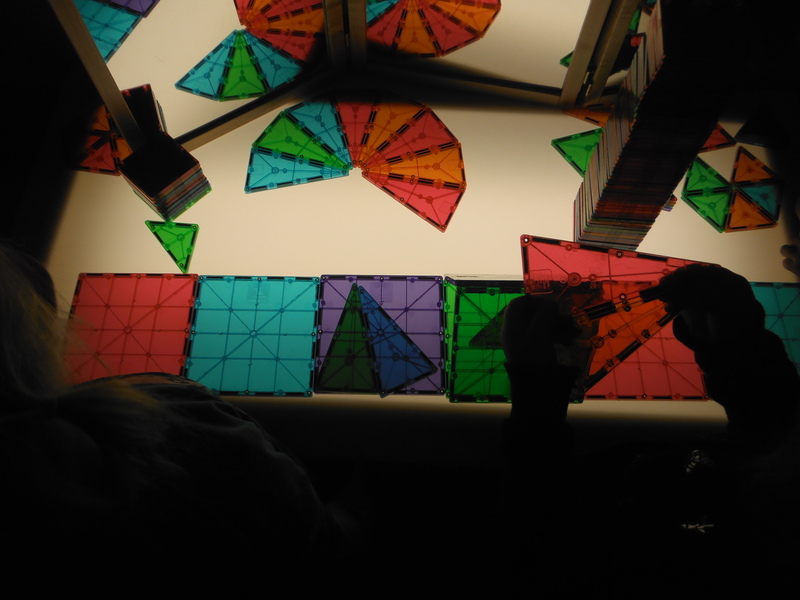 Covering the surface of the light table with tiles and using that as a building surface makes the whole project glow. 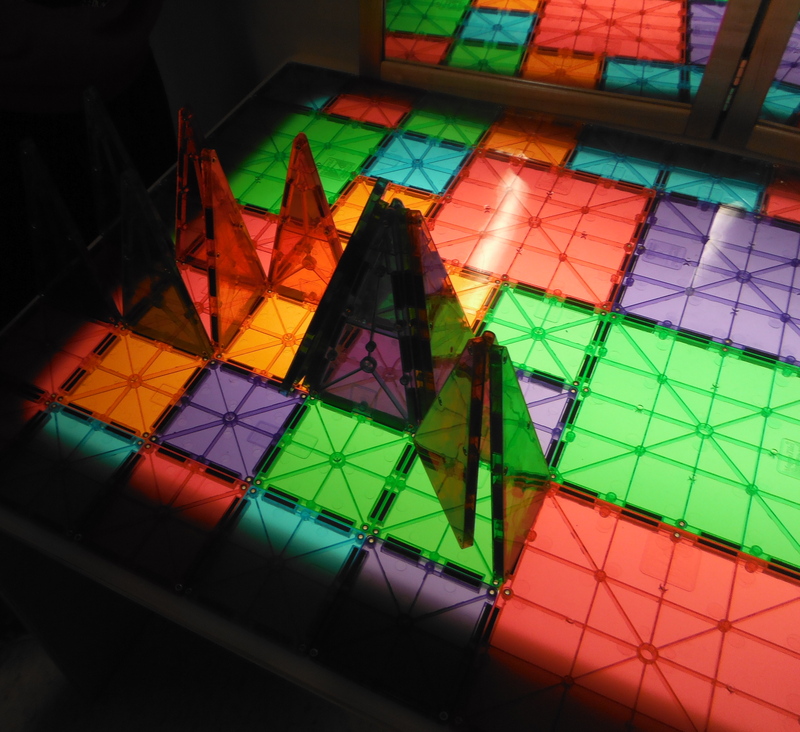 I just love the glowing effect of the light table. Their sense of how the pieces can fit together becomes more sophisticated the longer they play. 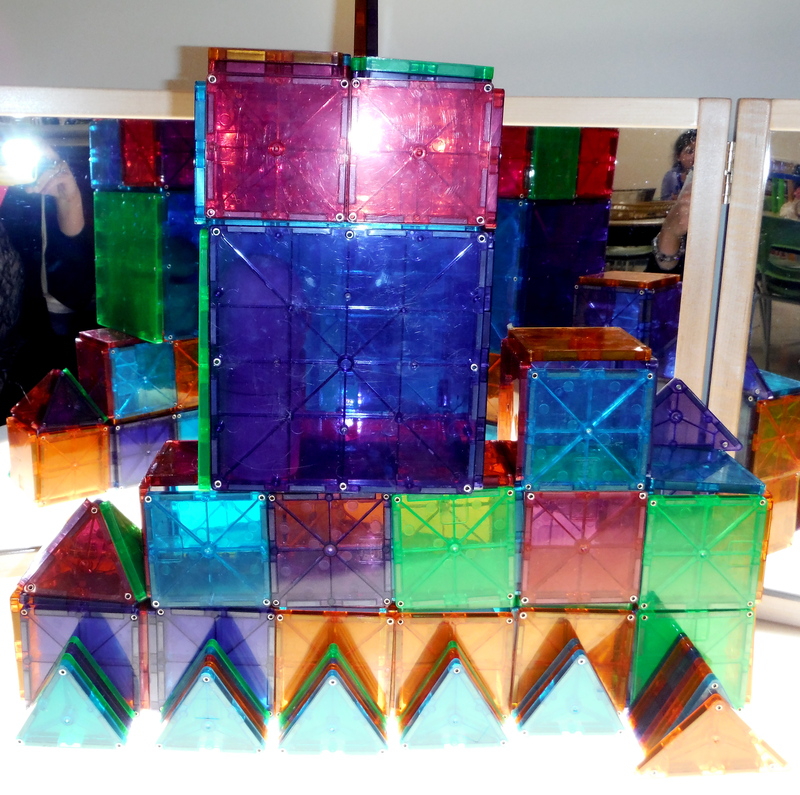 We had just talked about building stable structures using bigger pieces at the bottom and smaller pieces at the top. I think they’re trying to prove me wrong! I was impressed at how they were investigating volume here by using the wooden blocks to fill their cube. Next stop… the School of Architecture. 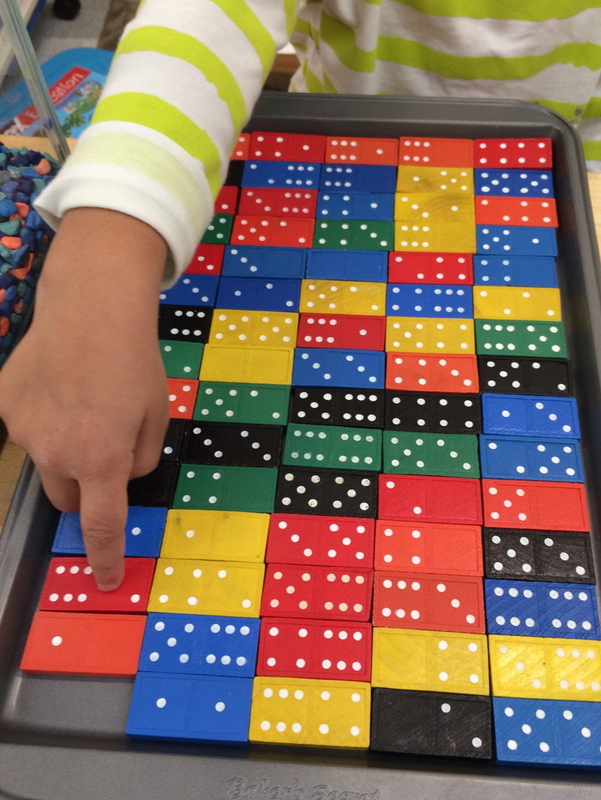 One of the best thing about having so many of these tiles is that while one group of students is using them on the light table, another group can be using them on the floor or on a table (or a couch in this case). That’s what BG was doing last week. BG called me over to show me what he had made. He had used the equilateral triangles to create two hexagons which he had linked together, nearly making three hexagons. We discussed what he had made and I introduced the name of his new shape. DW had been watching us as we had this conversation and came over to show me that he could use two triangles to make a square. BG then tried to make a square using his triangles but came up with a diamond instead. Why do some triangles make squares when you put them together while others don’t… what’s the difference? You can see in this photo that BG has completed his third hexagon. 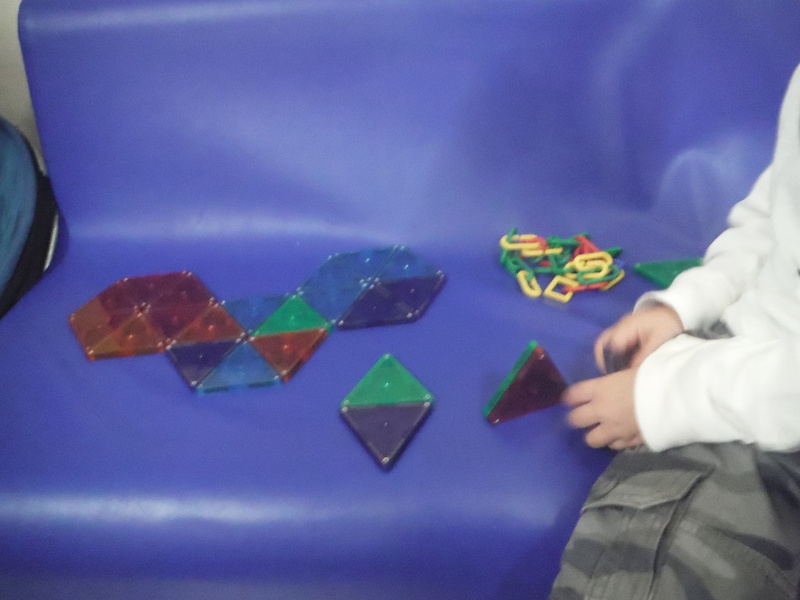 The next day, I kept noticing more and more students using shapes (both tiles and wooden blocks) to make new shapes and experimenting with tessellation. I’m intrigued at how these ideas spread. DW was listening to my conversation with BG… did other students notice? Were they observing on the sidelines without me noticing or is there some other process at work here? This week we’re going to share these observations with the whole group – I’m excited to see where it goes from here!